During restaurant week in NYC, it really is the best opportunity to try out different restaurants. There are endless dining venues in the city, that it can be a little overwhelming at times. I love the restaurant week program because the list makes life a bit easier by producing a list of participating restaurants offering 3 course menus for a very reasonable $25 for lunch and $35 for dinner. Of course there are some restaurants that don't have great reviews, and others that don't include any of their specialty or popular dishes on the restaurant week menu, but those are in the minority. 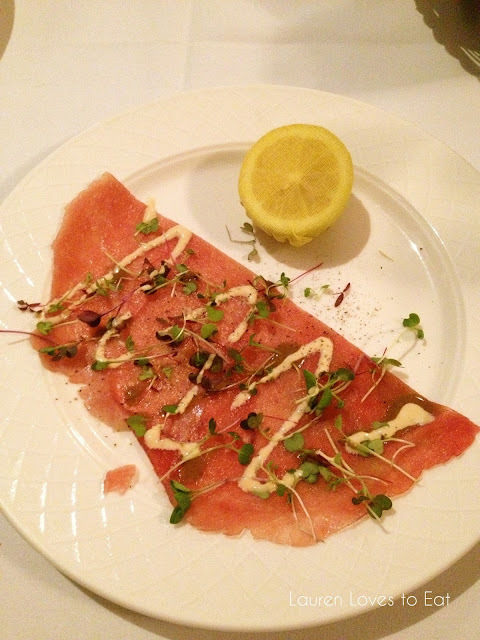 During the recent summer restaurant week (July 22-August 16), I was most drawn to Il Mulino because almost all the restaurant week menu items sounded appealing, and the restaurant is recognized as a NYC fine Italian dining staple. (President Obama and Bill Clinton actually lunched here a few years ago!) The place has been around for 30 years, and shows no signs of slowing down. The only disappointment was that although we had a reservation for 2pm, we had to wait half an hour to be seated. That's never happened to me before, and I don't understand how such a highly praised restaurant is so off with the reservations/table turning. The hostess also didn't update us once during this time about how long it would be till our table was ready. Besides this, everything went uphill afterwards. The dining room is very old school, with part print wallpaper, and part exposed brick. Tables are covered with white tablecloths, and the floor has drab maroon carpeting. It really felt like a place that hadn't changed its look in over 20 years. Even though, I found Il Mulino's food so impressive that I would highly recommend this for a date or a place to bring out-of-towners. A very generous complimentary bread basket. 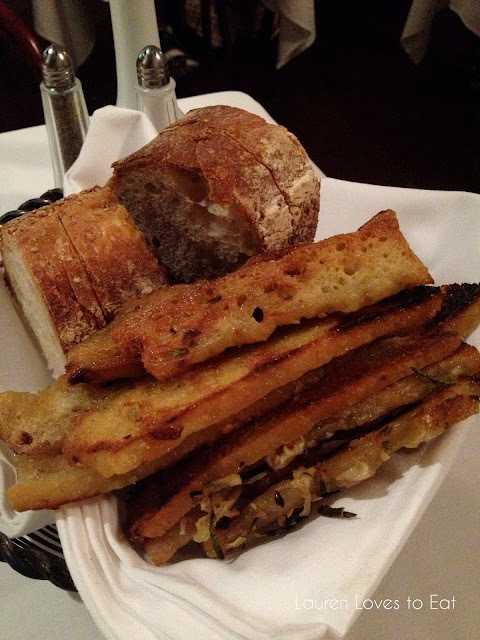 There was white and wheat bread, as well as parmesan and olive oil covered foccacia. Although the foccacia pieces were very toasted, they weren't too hard at all. It was a little too salty for my liking though. 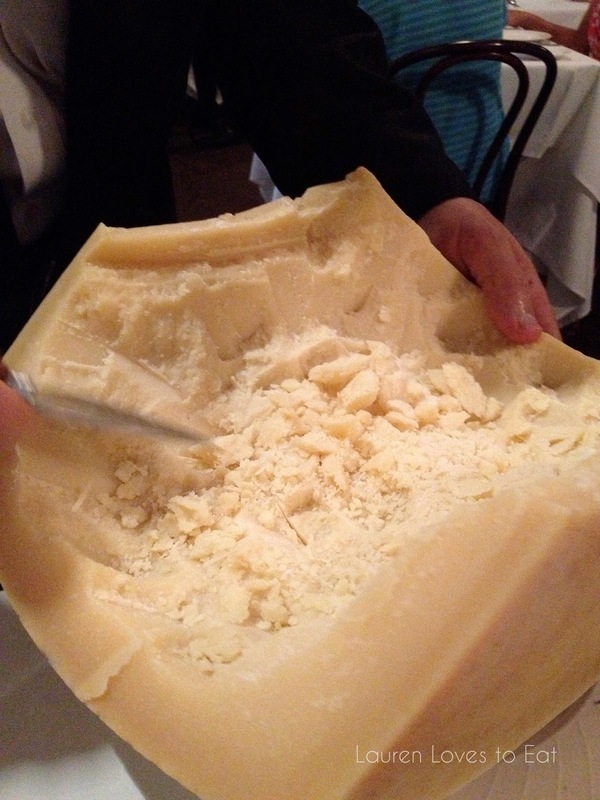 Before even ordering, a server brings a big chunk of cheese to the table, and slices some up for you. 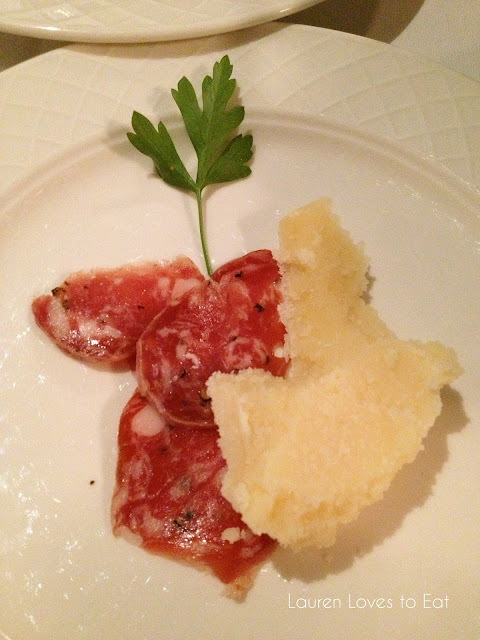 Another server then adds salami to the plate. The parmesan completely blew me away; rich, fresh (as fresh as cheese can taste), and perfectly crumbly. My friend abhors cheese, and she even really enjoyed it. 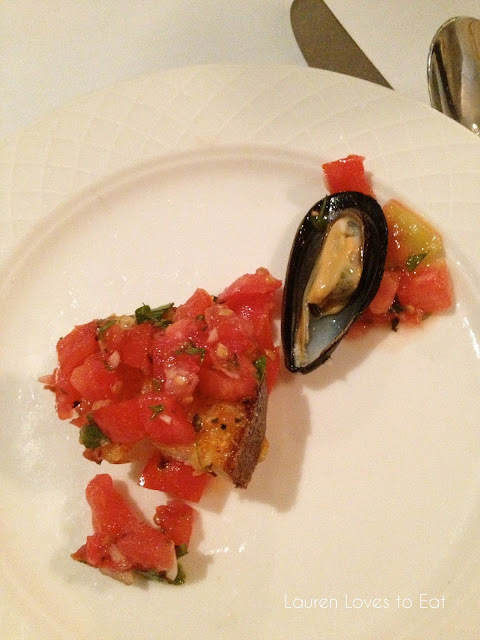 Another complimentary appetizer of bruschetta and a clam. The tomatoes had the perfect sprinkling of garlic and basil (my biggest nightmare is way too much garlic on bruschetta). I want to taste the fresh and sweet tomatoes! And here I did. They were topped on another perfectly toasted piece of olive oil drizzled slice of French bread. Amazing. 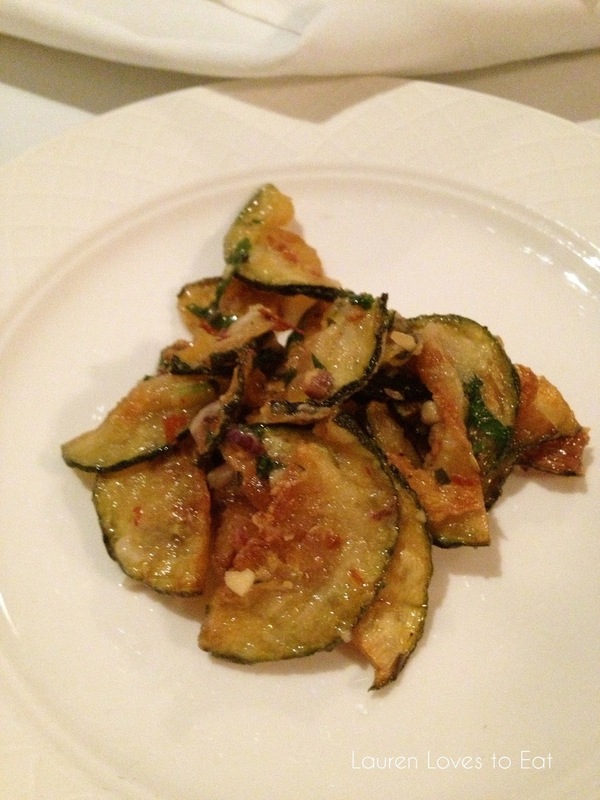 And the complimentary appetizers kept on coming... Zucchini ribbons with a hint of spice. We started with tuna carpaccio (with ginger vinaigrette). Unfortunately both found it very forgettable. The thin pieces of tuna were very bland, and the ginger vinaigrette did little to spice it up. 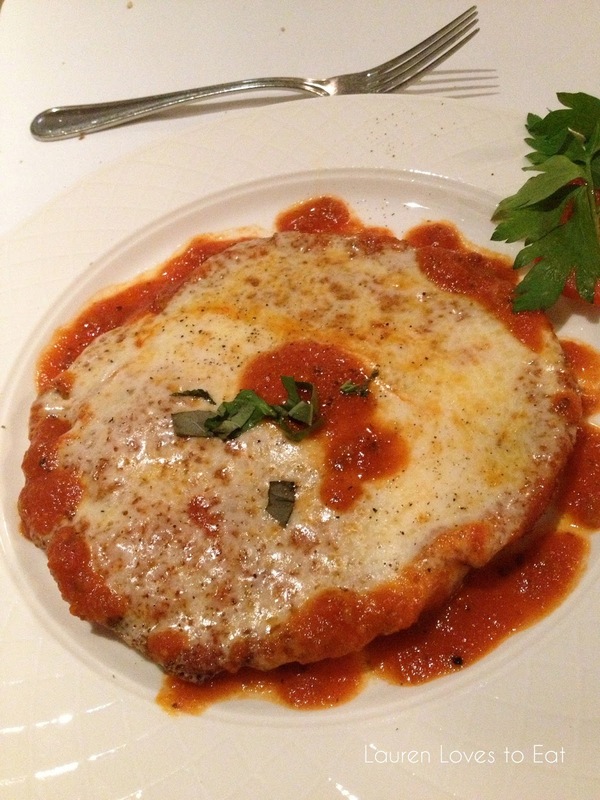 Chicken Parmesan: pounded, breaded chicken breast topped with imported cheese. The superbly tender piece of chicken was thin enough that you could really concentrate on the flavors of the very homemade-tasting marinara sauce, and the wonderful layer of cheese. Pesto Gnocchi: Homemade potato gnocchi with fresh basil pesto. I usually prefer pan-seared gnocchi, and was pleasantly surprised to find myself really in love with this dish. 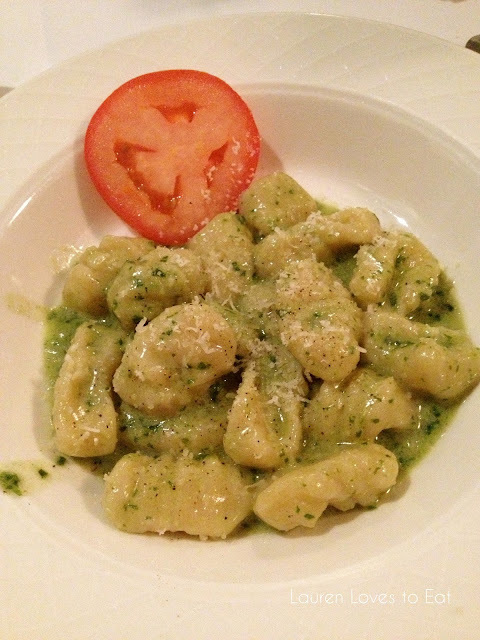 The gnocchi pieces seemed to be bigger than I've had at restaurants, and the pesto was so creamy and out of this world. I couldn't decide which entree I liked more. Prior to the restaurant visit, I read several reviews complaining about the small size of this dessert. Once I tried it though, I felt like because of how rich, dense, and utterly luxurious this cake is, it's really not feasible to have a large quantity. We thoroughly enjoyed the few bites each of us had. (We split both desserts too). Adorable presentation! 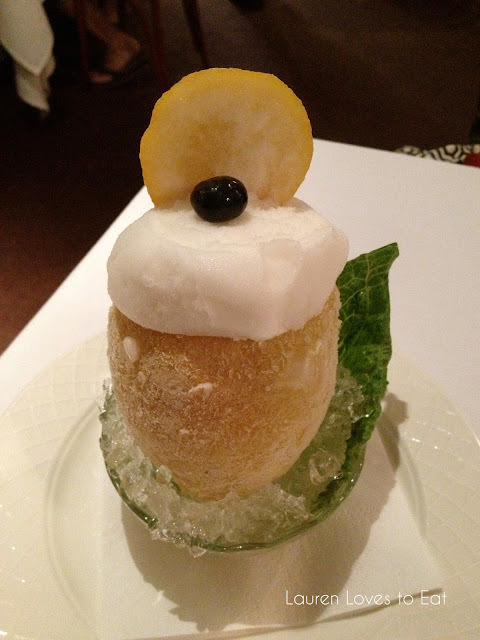 The lemon sorbet was presented inside a scooped out lemon-- the largest lemon I've ever seen in my life. The sorbet had a nice "crunch" to it, as it was very, very icy. 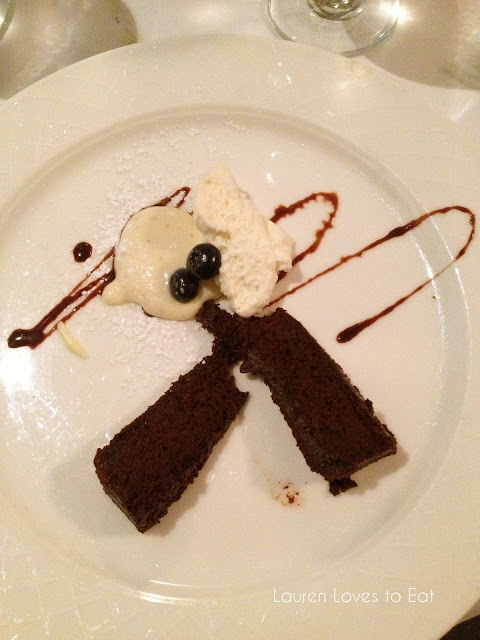 The dessert was very refreshing, and the light flavor was a perfect balance to the rich chocolate cake. Such a fantastic dining experience, with great service, and excellent food. OMG.. everything here looks so good. Next time they have restaurant week, I would love to go here. If you're up for it, I'll go again. Chicken Parm and the Gnocchi, hands down, the best!!! Yes, we should go! I've heard the restaurant is quite pricey, but they don't post prices online, so I can't check. So delicious though.